Alfred Lambremont Webre, JD, MEd, is a graduate of Yale University and Yale Law School with a Juris Doctor in International Law. He is a former Senior Policy Analyst at the Center for the Study of Social Policy at Stanford Research Institute, where he directed a proposed 1977 Carter White House Extraterrestrial Communication Study. He is an author, futurist, lawyer, environmentalist and a space activist who promotes an Exopolitics Initiative, and a ban on weapons and warfare in space. 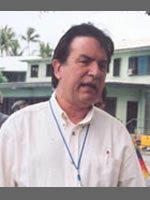 Alfred Webre is presently International Director of the Institute for Cooperation in Space, and host of a public affairs radio talk show in Vancouver, B.C. His principal websites are www.exopolitics.com, www.peaceinspace.org and www.peaceinspace.com. He currently lives in Vancouver, Canada.